In this thrilling and candid memoir, world record-holding and controversial Big Wave surfer Garrett McNamara chronicles his emotional quest to ride the most formidable waves on earth. Garrett McNamara—affectionately known as GMac—set the world record for the sport, surfing a seventy-eight-foot wave in Nazaré, Portugal in 2011, a record he smashed two years later at the same break. Propelled by the challenge and promise of bigger, more difficult waves, this adrenaline-fueled loner and polarizing figure travels the globe to ride the most dangerous swells the oceans have to offer, from calving glaciers to hurricane swells. But what motivates McNamara to go to such extremes—to risk everything for one thrilling ride? Is riding giant waves the ultimate exercise in control or surrender? Personal and emotional, readers will know GMac as never before, seeing for the first time the personal alongside the professional in an exciting, intimate look at what drives this inventive, iconoclastic man. Surfing awesome giants isn’t just thrill seeking, he explains—it’s about vanquishing fears and defeating obstacles past and present. Surfers and non-surfers alike will embrace McNamara’s story—as they have William Finnegan’s Barbarian Days—and its intimate look at the enigmatic pursuit of riding waves, big and small. Hound of the Sea is a record of perseverance, passion, and healing. 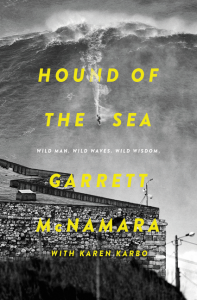 Thoughtful, suspenseful, and spiritually profound, McNamara reveals the beautiful soul of surfing through the eyes of one of its most daring and devoted disciples. Garrett Mcnamara holds the Guinness record for surfing the world’s largest wave, in addition to garnering numerous first-place wins in professional competitions around the world. He is the first foreigner ever to be awarded the prestigious Vasco de Gama Medal of Honor from the Portuguese Navy. McNamara splits his time between Hawaii, Portugal, and the rest of the world, where he explores with his family. Find out more about Garrett at his website and follow him on Facebook.